We're often asked for suggestions as to how to build spatial or figural reasoning ability. While not exactly synonymous the terms non-verbal reasoning, and matrix reasoning are often used to refer to how these skills might be tested. The Architect range of games provides a progressive and fun way to build your child's spatial reasoning skills. Equilibrio contains a series of spatial visualization puzzles. Players build amazing vertical structures based on illustrations in perspective. From simple shapes to complex structures, players develop stronger notions of geometric concepts and 3D visualization. While providing solid educational skills, it's also captivating and exciting! Some structures may seem almost impossible to do, but careful planning and persistence will always be rewarded with the satisfaction of completing the challenge! Players use 18 precision-cut Geoblocks (sold separately) to construct three-dimensional structures corresponding to those illustrated in the challenge booklet. The spiral bound booklet contains 50 illustrations, ranging from simple shapes, requiring only a few blocks to complex ones. As players develop stronger notions of perspective and geometric concepts, the challenges become more demanding. A simple color code allows players to easily track their progress. Equilibrio is part of the Architect line, which consists of 4 exquisite games of spatial visualization. 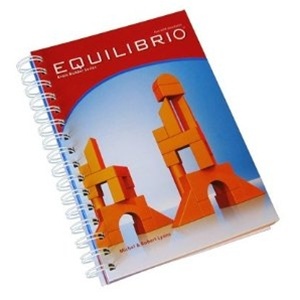 The focus of Equilibrio is building vertical shapes. In Tangramino players replicate 2 dimensional images using Geoblocks. Architecto focuses on translating 2D into 3D designs, while Cliko emphasizes perspective, depth, and geometric forms. In each of these games, players progress at their own rhythm, as puzzles gradually become more challenging. All games use the same set of Geoblocks and a spiral book with 6 color-coded levels of difficulty. The easiest puzzles in each book will engage your child. The most difficult puzzles will challenge most adults.This item is the instruction book only. The Geoblocks are sold separately. Equilibrio, Tangramino, Architecto, and Cliko all use the same Geoblocks.